It's a three-day weekend in the UK, so it had to pour down with rain on Saturday. I got caught in a thunderstorm on my run, but luckily, the rain dried up in time for me to get the bus back to Oxford, where I met my parents, the Bro, the sister-in-law, their Italian housemate and the sister-in-law's sister. We had a pint in the White Horse, a lovely, historic pub on Broad Street, before heading to Jamie's Italian for dinner. 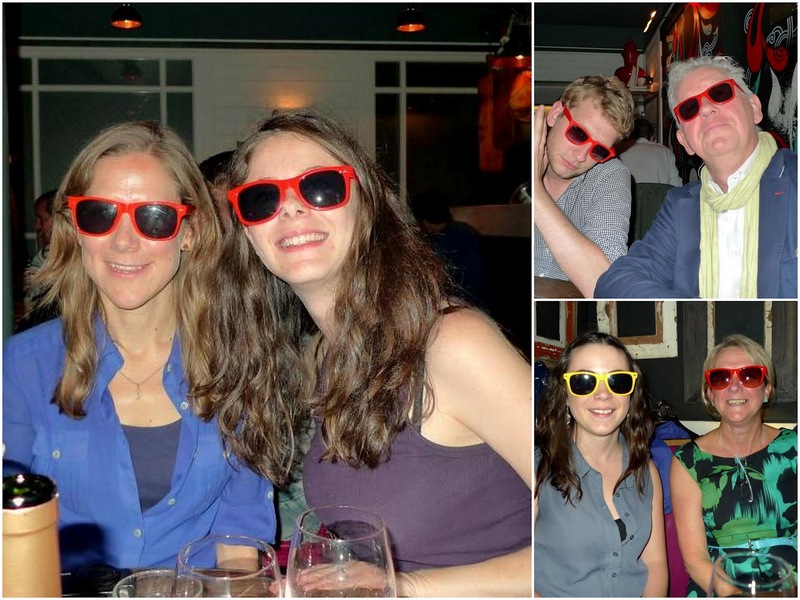 My parents are regulars and the wait staff proved remarkably patient through our various table changes, seat changes and photographs of us wearing coloured sunglasses. The coloured specs in-joke dates back to a trip to NYC in 2010 when Papa bought some $150 red sunglasses and then failed to tell the difference between that pair and the $10 knock-offs Maman picked up on the street. 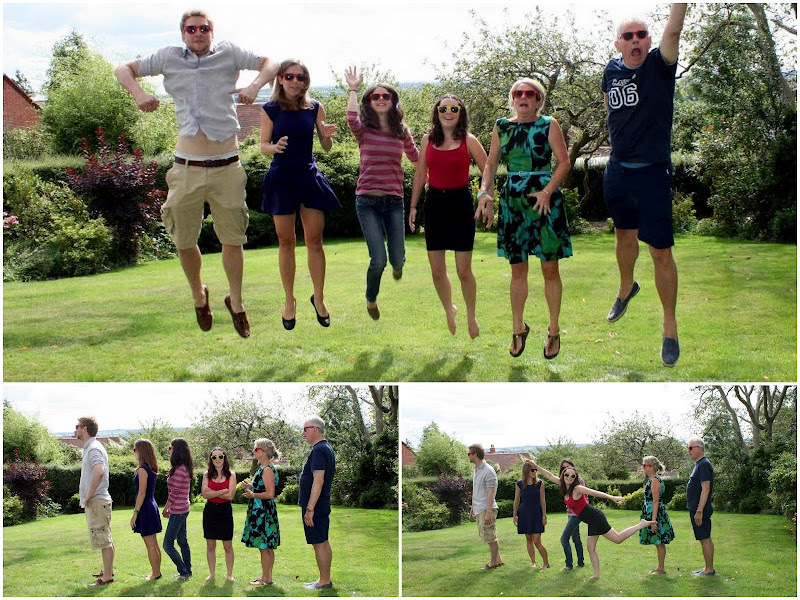 Since then, we have had to don them at most family gatherings, resulting in much hilarity and/or embarrassment. The SIL's maiden name is the same as a yellow citrus fruit and so before they got married, she was given a yellow pair to wear. Now that she's one of us, she gets red specs, while her sister--still citrus in name--wears the yellow sunnies. The food at Jamie's was good, as usual. I had roast chicken with funky (garlicky) chips, followed by a raspberry and amaretto brownie, which left me feeling way too full. I felt a little better after a run around Christchurch Meadow this morning, but at lunchtime, various members of our extended family started arriving and we had a big barbecue, which involved plenty more eating, plenty more red-specs-wearing and even a handful of leaps and a spot of badminton. Luckily, the sun decided to cooperate and it was the perfect day for lounging around on the patio all afternoon. 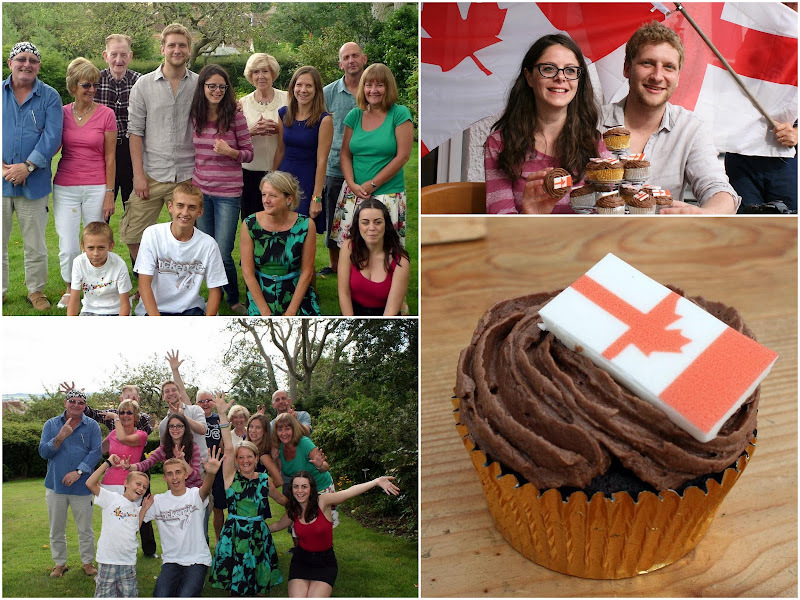 As it was the first time many of the relatives had seen the Bro and the SIL since their marriage, we had a mini-celebration, involving cupcakes decorated with the flags of their native countries.